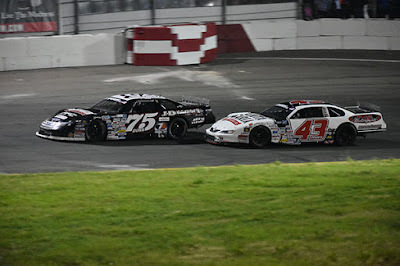 ROSEVILLE, Calif. (April 13, 2019) – Jeremy Doss withstood numerous challenges from Derek Thorn to win the JM Environmental 127 presented by 51FIFTY Energy Drink on Saturday night from All American Speedway, as the Roseville track welcomed both SRL and NASCAR races back to the one-third mile speedway. Matt Erickson and Jason Romero split entertaining season openers for the NASCAR Late Model division as well in a twin bill. 25 cars took the green flag for the SPEARS SRL Southwest Tour contest with eight lead changes among three different leaders. Each and every division set new track records under the new highline layout, including Roseville’s Eric Schmidt who topped SRL time trials with a 13.193 second lap. He drew the pole for the feature after the redraw of the top-eight as well. Thorn made early moves in turn three to advance several positions, finally clearing Linny White for second on lap 13. Thorn then went to work on reeling in Schmidt for the lead as the field snaked through lapped traffic by lap 30. A lap 33 caution for previous Roseville SRL winner Bobby Hodges saw Schmidt pick the inside line against Thorn. After a three lap battle, Thorn went around the outside to lead lap 36. When the caution fell on lap 45, Thorn picked outside on Schmidt and lost the lead to him on lap 47. Two laps later, Thorn executed a crossover move to get the lead back on lap 49. Schmidt then spun with contact from Linny White for second, dropping them both to the rear when the caution waved on lap 50. Doss assumed the second spot after the melee and went to work on Thorn. On a lap 60 restart, Doss used his inside line on a restart to grab the lead by lap 63. When the caution flew on lap 67, Doss chose the high line as drivers continued to search for the preferred positioning. Thorn took advantage, entertaining the fans with side-by-side racing that resulted in Thorn wrestling the lead away on lap 75. Thorn looked poised to win, but chose the inside line on a restart and lost the lead again to Doss on lap 87. On lap 91, Thorn knifed underneath Doss to take it back. Thorn held court on a successive restart, while Schmidt had driven from the rear of the field up to fourth in the process. Schmidt’s brilliant run through the pack ended in smoke on lap 119, setting the stage for an eight lap battle between Doss and Thorn – both with ties to the Clear Lake area. Thorn picked inside, and Doss made an incredible maneuver to cut inside and steal the lead on lap 121. Thorn attempted several times to apply his bumper to Doss, but Doss was undeterred. One last ditch attempt in turn four with two to go fell short and Doss ripped across the line with the win. Jacob Gomes rounded out an all former SRL champions podium in third ahead of Granite Bay’s Cole Moore and Linny White. Both NASCAR Late Model Twin 30s pitched Madera champion Matt Erickson and PCS and Roseville champion Jason Romero head-to-head. The first 30 lap event saw Erickson jump out to the early advantage ahead of Jason Aguirre. They raced several laps alongside each other before Erickson had a solid hold on the lead by lap 12. Romero followed him up into second. Erickson accumulated a comfortable margin before Lance Halm brought out a yellow flag in turn two. Erickson restarted inside Romero and held onto the lead despite some contact from behind with ten to go. The first 30 ended with Erickson returning to NASCAR victory lane, topping Romero, Aguirre, fast-timer Michael Mitchell, and Chris Scribner. Scribner led the second 30 lap race from the opening lap, bringing a train of cars with him on the outside of Elk Grove’s Shane Butler. Butler was shuffled to fifth by lap three. Aguirre applied early pressure on Scribner before he too faded, and eventually retired to the pits on lap 20. Scribner anchored a tightly wound four car lead pack and nearly had trouble while putting a lap on his father Rick Scribner just past halfway. Scribner continued on before Romero started peeking underneath. Erickson attempted as well down the backstretch with a brief three-wide move. Romero took over the lead on lap 19 with Erickson all over his back bumper. Erickson hounded him all the way to the finish in an entertaining duel with Mitchell, Scribner, and Halm the top-five. Both NASCAR Late Model races included the $150 KHI Management 4 Award with the fourth place finisher receiving the cash prize. Corey Englehardt of Granite Bay swept NASCAR Limited Modified action by taking the new track record in time trials on the new highline layout, winning the dash, and winning the main. But the sweep was not indicative of the competitiveness of the division. Ralph Bailey led the first lap of the main event before Loomis’ Nick Lyons led lap two. A lap four restart gridded Lyons inside Englehardt. They raced side-by-side with Englehardt crossing over to the inside of Lyons. They made contact into turn one that sent Lyons around and placed Englehardt in the lead. Lyons drove through the pack before a lap 27 caution set up the shootout to the finish. Englehardt narrowly completed a slidejob out of turn four to lead lap 28 and go on for the win. Derrick Doering debuted in third as well. Josh Whitfield came from worst-to-first win the inaugural race for the combined NASCAR Super Stock division. Richard Lavallee led the first five laps which saw entertaining three-wide battling. Sacramento’s Andrew Peeler took over the lead on lap five and Dan Farrington used the outside to advance into second place as well. Whitfield himself used the outside line to take over second on lap ten. Only five laps later, Whitfield clamped down on Peeler before a brief side-by-side battle. Whitfield led lap 16 and held on for a narrow .553 second win ahead of Peeler and Farrington while Lavallee was a close fourth. Ray Molina of Roseville earned the F4 season opening win after taking the lead on the fourth lap. Molina swept around the outside of early race leader Dennis Crook of Fernley, Nev. Crook settled for third after the 20 lap contest. 14 year-old Aiden Daniels won his Jr. Late Model debut at the speedway. The Fort Bragg driver topped Smartsville’s Brody Armtrout, 13, and 12 year-old Lane Anderson of Fort Bragg. Trey Daniels, 10 year-old younger brother of Aiden, made his debut at Roseville in the Mini Cup vs. Bandolero driving a Bandolero machine. The 15 lap contest saw Daniels pace Dylan Krug and Kenna Mitchell in a closely wound lead pack for the duration of the race with Daniels winning the fast-paced feature. NASCAR racing continues at the All American Speedway on Saturday night May 4th including twin main events for the Limited Modifieds and the first Trailer Bash of 2019.